^ William Smith, Dictionary of Greek and Roman Biography and Mythology, Taylor and Walton, 1846, p. 776. ^ Stewart, Andrew W. (1996), "Hagesander, Athanodorus and Polydorus", in Hornblower, Simon, Oxford Classical Dictionary, Oxford: Oxford University Press. ^ Richard Brilliant, My Laocoön - alternative claims in the interpretation of artworks, University of California Press, 2000, p. 29. ^ See Beard, Mary (2 February 2001), “Arms and the Man: The restoration and reinvention of classical sculpture”, Times Literary Supplement, http://tls.timesonline.co.uk/article/0,,25829-2465943_2,00.html . Beard, in fact, is highly sceptical of the identification, noting that ‘the new arm does not directly join with the father's broken shoulder (a wedge of plaster has had to be inserted); it appears to be on a smaller scale and in a slightly differently coloured marble’. ^ (BANDINELLI, Baccio. Web Gallery of Art. Retrieved on March 27, 2009. 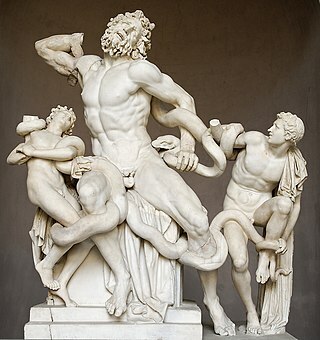 ^ Pliny The Laocoon in Antiquity. Institute of Design + Culture, Rome. Retrieved on March 27, 2009.